Wayne Marcinko hadn’t been as involved in his son’s Scouting career as he’d hoped. 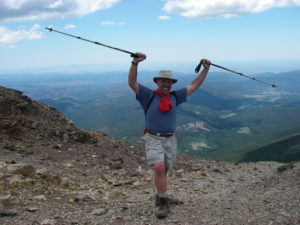 When he went to Philmont with his son he realized that he was running out of camping trips to go on. In talking with the Troop’s Scoutmaster he also realized that the majority of the Troop was going to age out along with his son. When he returned from New Mexico, Marcinko went through all of the necessary training and prepared to take over his son’s Troop. “I thought I was having a panic attack,” he said, reflecting on his first meeting as Scoutmaster. Another parent leaned over to him and told him to just be loud and excited, the rest would come with time. Wayne took that lesson to heart and became a loud and charismatic leader of his small Troop despite his lack of experience. He hadn’t even memorized the Scout Oath and Law by the time he led his Scouts on their first campout. Wayne loved serving as Scoutmaster though, and took naturally to the position. That Fall, Wayne had the opportunity to preside over his first Eagle Scout Court of Honor. When it came time for him to offer his Scoutmaster’s Minute he stepped up to the microphone and sang the classic Scouting song “Follow Me, Boys.” Ever since that day he has been known throughout the Atlanta Area as the Singing Scoutmaster. Tagged Philmont, scoutmaster. Bookmark the permalink.